Fanny Brice (October 29, 1891 – May 29, 1951) was a popular and influential American comedienne and singer who starred in theater, radio, and film. She was the creator and star of the top-rated radio comedy series, The Baby Snooks Show that ran from 1936 to 1951. In an era when ethnic comedy was the norm Brice delighted audiences with her Yiddish accent and satirical characters for more than forty years and won a following in almost every branch of American show business. In 1909 she scored her first success singing an Irving Berlin song Sadie Salome, Go Home in the musical The College Girls. Brice’s infectious comedy style and vocals made her the featured performer of nearly all the Ziegfeld Follies from 1910 through 1923. With the arrival of talking pictures, Brice went to Hollywood and starred in My Man (1928), and Be Yourself (1930). 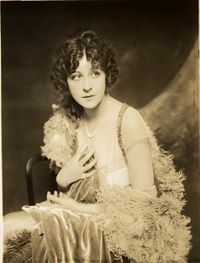 Brice became the first woman to star in a sound motion picture, but both films were failures and Brice soon returned to Broadway. In addition to her Broadway and radio success, Brice also had top ten hits with My Man (#1 in 1992), Second Hand Rose (#3, 1922), I’m an Indian (#9, 1922) and I’d Rather Be Blue Over You (Than Be Happy With Somebody Else) (1929). Barbra Streisand starred as Brice in the 1964 Broadway musical Funny Girl, and in 1968, Streisand won the Academy Award for Best Actress for reprising her role in the film version. Fanny Brice (occasionally spelled Fannie) was the stage name of Fania Borach, born in New York City, the third child of relatively well-off saloon owners of Hungarian Jewish descent. Her mother, Rose Stern, left a small village near Budapest to come to America in 1877. Charles Borach, her father, set off from Alsace, France during the late 1870s or early 1880s. When they met in Manhattan, Rose was working at a sewing machine in a fur factory and Charles was a bartender in a Bowery saloon. They married in 1886 and at the time of Fanny's birth, they were living on Forsyth Street. By 1895, they had left the Lower East Side's congestion and crime for Newark, New Jersey. Borach's gambling caused his wife to leave him, taking her children to Brooklyn (c. 1902). Charles Borach followed them to New York and drifted into a series of odd jobs. When he died in 1912, he had lost virtually all contact with his family. Brice, who accepted the estrangement from her father as irrevocable, would mirror her mother's lack of marital success in her own life. A chronic truant who ended her formal education around the eighth grade she found success in neighborhood amateur night contests, beginning with a victory in 1906 at Keeney's Theatre, Brooklyn's leading vaudeville theater. While working at a Manhattan nickelodeon, she learned that musical comedy star George M. Cohan was holding auditions for The Talk of New York, the first of three shows he had written for the 1907–1908 season. Elated when she won a place in the chorus, the inexperienced Brice was fired before the musical's December 1907 opening. After another disappointment performing in a production of the popular melodrama The Royal Slave she turned to burlesque, the least selective branch of the entertainment business, and spent three formative years on the Eastern Burlesque Circuit. Performing in The Transatlantic Burlesquers (1907–1908) as chorus girl Fannie Borach, she joined the cast of The Girls from Happyland for the 1908–1909 season. 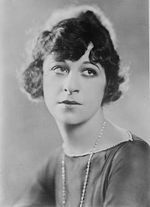 Although the show was poorly received, it was a landmark in her career because it marked her first appearance as Fanny Brice, the name she used for the rest of her life. She explained in a 1946 interview that she was tired of being called "Borax" and "Boreache" and chose Brice, the surname of a family friend, to prevent further teasing. She was also, undoubtedly, trying to seem less ethnic, less foreign, and less Jewish, thereby broadening her appeal. In Max Spiegel's The College Girls in 1910, she had her first sizable role. Cast as Josie McFadden, she won praise for the specialty number she performed in the show's second act, particularly her rendition of Sadie Salome, Go Home. It was, in her words, "a Jewish comedy song" by Irving Berlin. A spoof of Salome dancing, a phenomenon once described as "the phoniest craze to hit show business," the song was the first Brice performed with a Yiddish accent. Ethnic comedy was very much in vogue in the early years of the twentieth century, and minority groups were parodied by the popular arts. With Sadie, she created the first of her many memorable characters and found the performance style that became her signature, a style based on deft parody, broad physical humor, and an accent used for comic effect. With her Sadie performance she managed to attract the attention of producer Florenz Ziegfeld, Jr., who hired her for his Follies of 1910. While Brice did not conform to the prevailing notion of feminine beauty that was promoted by the Follies she would become the funniest female amongst the prettiest. From the trailer for the film The Great Ziegfeld (1936) in which Brice appeared as herself. Disappointed by her small part in the Follies of 1910, Brice added a ragtime song, Lovie Joe, which quickly became one of the show's big hits. Handicapped by poor material, however, she was far less successful in the Follies of 1911. When Ziegfeld failed to renew her contract at the end of the season, she signed with the rival Shubert organization and did not perform under the Ziegfeld banner again until 1916. During the intervening four years, she took part in seven musical revues, three of them in London, and had vaudeville bookings in over thirty cities. She failed to win critical acclaim as a Jewish maid in two Shubert productions, The Whirl of Society in 1912 and The Honeymoon Express in 1913. It was not until she hired songwriter Blanche Merrill that she developed into the "character comedienne" she was destined to become. They began collaborating in 1915, and Merrill, who specialized in writing for women, created material that suited her. With such songs as Becky's Back in the Ballet and The Yiddish Bride, she soared to stardom in The Ziegfeld Follies of 1916 and 1917. In the 1921 Follies, she was featured singing My Man, which became both a big hit and her signature song. She made a popular recording of it for Victor Records. The second song most associated with her is Second Hand Rose. She recorded nearly two dozen record sides for Victor and also cut several for Columbia Records. In an effort to develop her talents as a dramatic actress Brice appeared in 1918’s Why Worry?, but even the last-minute addition of two Merrill songs (I'm an Indian and I'm a Vamp) could not bring her success. She would be similarly disappointed in 1926 when David Belasco's production of Fanny was panned by critics. From 1918 to 1927 appeared in three more editions of the Ziegfeld Follies (1920, 1921, and 1923), four other Ziegfeld shows (two Nine O'Clock Revues and two Midnight Frolics), and two non-Ziegfeld productions (Irving Berlin's Music Box Revue in 1924 and the Hollywood Music Box Revue in 1927). She made several records, produced Is Zat So? and The Brown Derby, and filled the remaining time with lucrative vaudeville engagements. She was billed with Eddie Cantor, Will Rogers, W. C. Fields, Willie Howard and other top Broadway performers through the years. 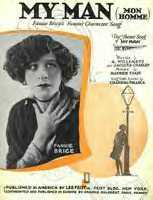 1921 sheet music for Fanny Brice's "My Man"
Brice did some of her best comic material in the Follies of 1921 and caused a sensation with an uncharacteristically serious selection, My Man. Instead of the animated parody she typically offered, she stood almost motionless, sang without a funny accent, and created the illusion that she was sharing her own painful experience. The moving song always produced a powerful emotional effect on audiences who clamored for it. Brice had some of her best comic material in the Follies of 1921, including spoofs of Ethel Barrymore in Camille and also sang two of her most memorable songs Second Hand Rose and My Man. In 1923, growing tired of being a typecast Jewish joke, she decided to have cosmetic surgery on her nose thinking it would help her dramatic aspirations. Disappointed both with the results of the surgical procedure and the response to her attempts at more serious material, Brice accepted the inevitable and returned to comedy. In 1928, after one last attempt at breaking free from her comedy roles she was promoted by Warner Brothers as a "female Jolson," and became the first woman to star in a sound motion picture. Much to her dismay My Man was a box-office disaster. Although she would make six movies in all (including Be Yourself, 1930; The Great Ziegfeld, 1936; Everybody Sing, 1938; and Ziegfeld Follies, 1946), film stardom eluded her. Brice married Billy Rose in 1928 and he produced his first show, the musical revue Sweet and Low, in 1930. The revue featured music by Rose and performances by Brice, George Jessel and Arthur Treacher, running for a total of 184 performances. His next two Broadway shows, the 1931 musical revue Billy Rose's Crazy Quilt (a reworking of "Sweet and Low"), which was produced, directed, and written by Rose and featured Brice and Ted Healy, closed after only 79 performances at the 44th Street Theatre. Ziegfeld Follies publicity photograph of Fanny Brice. Brice achieved her greatest stage triumphs in the Ziegfeld Follies of 1934 and 1936 where she created some of her most memorable comic characters. From Soul Saving Sadie (a spoof on evangelist Aimee Semple McPherson) to Countess Dubinsky (a parody of stripteasing and fan dancing) and Modernistic Moe (a burlesque of modern dancer Martha Graham). Her characters included a toddler Baby Snooks which she performed complete with hair ribbon, starched pinafore, ankle socks, and Mary Janes. 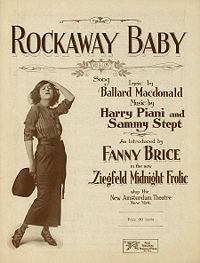 Baby Snooks was based on a character Fanny had spontaneously created at a party in 1921, and had used again for sketches in Sweet and Low before introducing her in the Follies. This character would lead Brice to stardom she desired. From 1936 until her death in 1951, Brice became a radio star as a precocious, bratty toddler, who had no accent, named Snooks. With antisemitism rampant in the United States and Europe, Brice apparently realized that a Yiddish accent was probably no longer the best way to win a national following. "Schnooks," as she liked to call her, ensured a much wider appeal. With first Alan Reed and then Hanley Stafford as her bedeviled Daddy, Baby Snooks premiered in The Ziegfeld Follies of the Air in February 1936 on CBS. She moved to NBC in December 1937, performing the Snooks routines as part of the Good News show, then back to CBS on Maxwell House Time, the half-hour divided between the Snooks sketches and comedian Frank Morgan, in September 1944. She was back to NBC in November 1948, in a full show of her own, first called Toasties Time but soon known as The Baby Snooks Show. Brice was so meticulous about the program and the title character that she was known to perform in costume as a toddler girl even though seen only by the radio studio audience. She was 45 years old when the character began her long radio life. She became completely devoted to the character, as she told biographer Norman Katkov: "Snooks is just the kid I used to be. She's my kind of youngster, the type I like. She has imagination. She's eager. She's alive. With all her deviltry, she is still a good kid, never vicious or mean. I love Snooks, and when I play her I do it as seriously as if she were real. I am Snooks. For 20 minutes or so, Fanny Brice ceases to exist." Brice did Baby Snooks on television only once, an appearance in 1950 on CBS-TV's Popsicle Parade of Stars. This was Fanny Brice's only appearance on television. She returned with Stafford and the Snooks character to the safety of radio for her next appearance, on Tallulah Bankhead's legendary big-budget, large-scale radio variety show, The Big Show, in November 1950, sharing the bill with Groucho Marx and Jane Powell. Six months after her Big Show appearance, Fanny Brice died in Hollywood at the age of 59 of a cerebral hemorrhage. Brice had a short-lived marriage in her teens to a local barber, Frank White. Her second husband was professional gambler Julius "Nicky" Arnstein. Prior to their marriage, Arnstein served 14 months in Sing Sing for wiretapping where Brice visited him every week. In 1918 they were married after living together for six years. In 1924, Arnstein was charged in a Wall Street bond theft. Brice insisted on his innocence and funded his legal defense, at great expense. Arnstein was convicted and sentenced to the Federal penitentiary at Leavenworth where he served three years. Released in 1927, the unfaithful Arnstein disappeared from Brice's life and that of their two children. She went on to marry songwriter and stage producer Billy Rose and appeared in his revue Crazy Quilt, among others. That marriage failed as well. Brice suffered a serious heart attack in July 1945 but was well enough to resume her radio show in the fall. The profitable series continued until 1948, when she went off the air during a highly publicized contract dispute caused by fierce competition from the latest technological marvel to arrive on the show business scene: television. Rather than take a salary cut, Brice refused to work and began an autobiography she would not live to complete. Returning to radio in 1949, she continued happily wreaking havoc as Snooks. She had no interest in making the transition to television and, ironically, was contemplating retirement when she had a stroke on May 24, 1951. She died in Los Angeles, five days later, without regaining consciousness. She is interred in the Westwood Village Memorial Park Cemetery in Los Angeles. The May 29, 1951, episode of The Baby Snooks Show was broadcast as a memorial to the star who created the brattish toddler, crowned by Hanley Stafford's brief on-air eulogy: "We have lost a very real, a very warm, a very wonderful woman." Her original interment was located at Home of Peace Memorial Park. As most of Brice's early work centered on live performances, much of her legacy is sadly lost. The complete list of her recorded songs totals less than 20 titles, and much of her limited film work has not been preserved. Her success as Baby Snooks endures, but her talent and appeal in live theater is now mostly legend. She is a posthumous recipient of a Grammy Hall of Fame Award for her 1921 recording of My Man. For her contribution to the motion picture industry, she has a star on the Hollywood Walk of Fame at MP 6415 Hollywood Boulevard. Barbra Streisand starred as Brice in the 1964 Broadway musical Funny Girl, which centered on Brice's rise to fame and troubled relationship with Arnstein. In 1968, Streisand won the Academy Award for Best Actress for reprising her role in the film version. The 1975 sequel Funny Lady focused on Brice's turbulent relationship with impresario Billy Rose and was as highly fictionalized as the original. Streisand also recorded the Brice songs My Man, I'd Rather Be Blue Over You (Than Happy with Somebody Else) and Second Hand Rose, which became a Top 40 hit. Lily Tomlin popularized a Baby Snooks-like character on television, Edith Ann, who sits in a rocking chair and makes ironic observations on the adult world. ↑ 1.0 1.1 1.2 1.3 1.4 1.5 1.6 In Focus: Jewish Women in Comedy Jwa.org. Retrieved August 26, 2008. ↑ Biography for Billy Rose Imbd.com. Retrieved August 28, 2008. ↑ Norman Katkov, The Fabulous Fanny. The Story of Fanny Brice (New York: A.A. Knopf, 1953, OCLC 26482648). 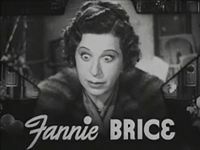 ↑ Fanny Brice - Comedienne (1891 - 1951) Bbc.co.uk. Retrieved August 28, 2008. Fanny Brice: In Photographs Youtube.com. The fanny brice collection Brice.nl. Fanny Brice Dies at the Age of 59 Nytimes.com. This page was last modified on 26 March 2017, at 16:33.